For power outages, one of the things that I recommend you do it purchase some cheap flashlights. I suggest keeping them all over your house in multiple locations in every room. I also like tactical flashlights with strobe features for blinding burglars. I found the Cree 7 Watt, 300 Lumen Tactical Flashlight and it was great for both of these applications. It is great for placing all over the home because it is usually around $3-5 and is cheap enough to buy a bunch of them. It is great for blinding people because LEDs are already blinding, and with the strobe feature, they do even better. 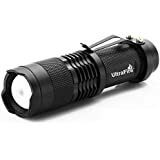 You should keep a couple in your hiking pack as a backup to your expensive tactical flashlight. I have an Advanced Preparedness System where you get more product recommendations, along with booklets, workbooks, templates, audio instruction by me, and much more to help get more prepared, extremely quickly. Click Below to watch the video.